To a regionalist, the folk embodied a kind of cultural stability. Following the Great War, regionalists throughout America gained a greater collective intelligence as to exactly what they wanted to do, and they ultimately turned regionalism into a civic religion. The regionalist movement sought to emancipate individuals from the industrial, scientific and standardized shackles of mass culture. 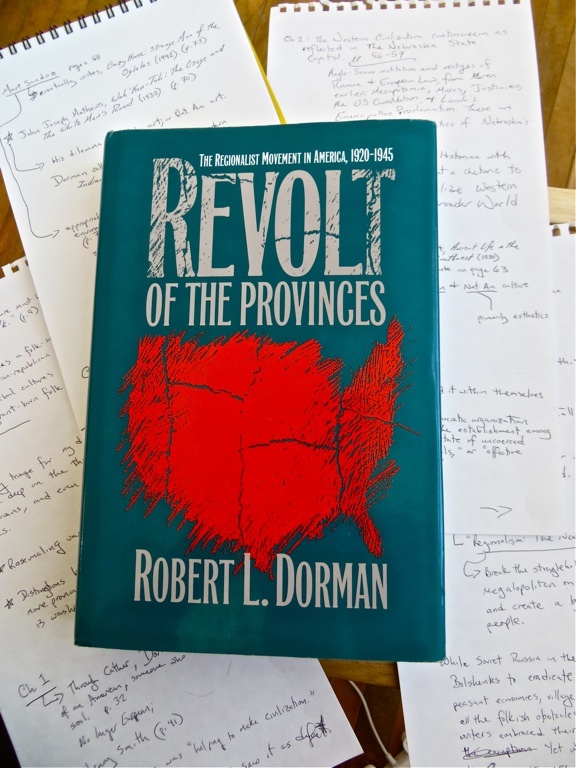 Dorman explains how academics, novelists and scholars captured and cultivated the civic religion of regionalism throughout America between the first and second world wars. His first chapter opens with a Willa Cather quote from O Pioneers!, and that is how “The history of every country begins in the heart of a man or a woman.” In this singular sentence, Cather is remarking how individuals in their own particular localities have a particular spirit, a genuine love or heart for a place, and through this a sense of history and community is cultivated. We see this in Cather’s My Ántonia (1918), and also in Walter Prescott Webb’s The Great Plains (1931). In this latter case, Webb’s work is no doubt tinged with Anglo-Ameri-centrism (what we might call Social Darwinian Racism-Light). But what Webb also attempted to do with The Great Plains was to cultivate historical memory in a particular region of America, and through this forge a common identity. By doing this, perhaps, the folk from the physical Great Plains could indeed have their differences — amongst the southern, central and northern Plains — but also be capable of a kind of unity. Through this unity, the folks on the Great Plains could identify with one another, and thereby oppose, navigate or manage non-Great Plains folks all the more (in many ways, this was a mission of Bernard DeVoto’s, a contemporary of Webb’s. At every opportunity, DeVoto played the America West, a plundered province, off of the east coast Fat Cat Tycoons and the Federal Government). Dorman’s monograph also can be contextualized with the 1950s works of Wallace Stegner and Carl Kraenzel. When Stegner wrote Wolf Willow (1955) and Kraenzel wrote The Great Plains in Transition (1955), they both considered the Great Plains and the American West in what they thought of as a kind of failed afterglow of the regionalist movement from 1920-1945. In a closing (but by no means a final) remark, it is also interesting to consider Dorman’s subjects in a broad theoretical, history-of-ideas scheme of things. This regionalism was a part of a global movement, something that could be likened to R.G. Collingwood’s idealist and aesthetic reaction to the late-19th century “scientific positivism.” In a way, Dorman hints at this global movement when he compares American Regionalists to what was happening at the time in the Soviet Union. But he would have been better to compare Cather, Webb, Henry Nash Smith and Mari Sandoz to, for example, Vasily Grossman and his humanism, this instead of comparing American regionalists to official Soviet policy. While Soviet Russia in the 1930s encouraged Bolsheviks to eradicate regionalisms — peasant economies, village ties, languages, churches, all the folkish obstacles — so did Washington, D.C. encourage a much softer version of such policy, one that is laid out, for example, in Margaret D. Jacobs, White Mother to a Dark Race: Settler Colonialism, Maternalism, and the Removal of Indegenous Children in the American West and Australia, 1880-1940 (2011). In the first half of the twentieth century, Industrial Capitalism and Industrial Communism — or, to capture them both, Industrial Modernity — imposed itself on the world and its regions. In our post-Cold War, 21st century world, scholars are perpetually in a position to push global, regional and public historical knowledge in infinitely new directions, and Dorman’s 1993 work has set down an excellent foundation. This entry was posted on Saturday, February 23rd, 2013 at 2:46 pm	and tagged with Great Plains History, Robert L. Dorman, World History and posted in Uncategorized. You can follow any responses to this entry through the RSS 2.0 feed.